Fear Factor: Can We Learn to Live with Predators Among Us? As residential communities move farther into wildlife habitat and highly adaptable coyotes move into suburban and urban areas, traditional urban/rural divisions break down. On a bright July day about 10 years ago, I set out for a hike on the steep and forested Pacific Crest Trail above the McKenzie River in the foothills of Oregon’s Cascade Mountains. Rounding a switchback, I stopped at a gap in the trees to admire the distant snow-covered peaks. As I was gazing at the view, I heard a loud thwock! — the sound of something heavy moving. I turned toward the noise expecting to see a large bird or fallen limb. What I saw instead, about 20 feet away, was a thick rope of tail curved around a tree trunk, a broad tawny face, and tufted ears. At first I thought it was a fox. But I quickly realized it was a big cat. I could see the flecks in its eyes and sense the power of its muscle and mass. Unsure of what to do, I stood utterly still, holding my breath. The cougar and I eyed each other for a moment. Then the cat leapt off the tree and ran uphill through a tumble of basalt. I swiftly made my way down the trail, the words thank you and I will not be lunch running through my head. I have been told that people can spend a lifetime in this part of the world without ever seeing a cougar. I have now seen two. I have also watched wolves from atop a snowy ridge in the Lamar Valley of Yellowstone National Park while a family of coyotes frolicked in a meadow nearby. I have hiked through grizzly country in the northern reaches of Montana and Wyoming, shouting, clapping, and clattering what are sometimes jokingly referred to as “bears’ dinner bells.” I’ve carried pepper spray and, once, a friend’s rifle, as we bushwhacked on an Alaskan island, and have spied on a grizzly cub munching late summer willow shoots along a stream north of the Arctic Circle. But it’s one thing to encounter these powerful predators on excursions into wilderness areas and quite another to meet them in your backyard — or in a restaurant, as happened last year when a coyote wandered into a sandwich shop in downtown Chicago. Reactions to these encounters vary from a sense of privilege and wonder to fear, hostility, and an urge — well ensconced in the American tradition — to eliminate whatever might pose a threat to personal security and livelihood. Historically, Americans have a troubled relationship with the animals at the top of the continent’s food web — bears, cougars, coyotes, and wolves. Newcomers to the New World worked systematically to remove them, and attempted to trap, shoot, and poison predators into submission. We continued this agenda as we put more and more of the American landscape into urban, industrial, and agricultural development. As a result, by the mid-20th century, the lower 48 had lost most of its cougars, grizzlies, wolves, and coyotes. But in recent decades these predators have begun to rebound. During the 1960s, mountain lions were classified as game animals, and controlled hunting seasons that limited their killing were established. 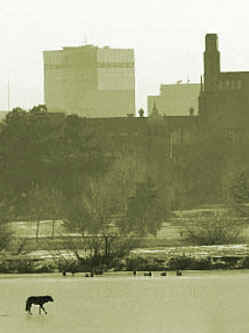 Then, in the 1970s, the Endangered Species Act was introduced, under which grizzlies and gray wolves were protected. By the 1990s, wolf reintroduction programs had begun in some states. At the same time, in many places, the absence of the very top predators — particularly mountain lions and wolves — allowed coyote populations to expand so that the canines are now once again found in every state but Hawaii. With little undeveloped country left in the US, people and predators increasingly find themselves sharing the same fragmented habitat, and encounters have become more frequent. Consequently, we are now navigating new territory in our relationship with animals that not only have the ability to snack on small pets but also the potential to overpower and kill people and livestock. While the wilderness that defines these predators is, in many ways, more remote, imperiled, and ecologically precious than ever, these emissaries of the wild are pushing us to rethink our relationship to the land and our ecosystems. But as current debate over Oregon’s cougar management plan shows, predators remain an emotional subject for both staunch defenders of the animals and those eager to defend against them. When it comes to wolves and grizzlies, “there are so few of them,” says Brian Vincent, communications director of the Earth Island project Big Wildlife, that for many people “there’s a mystery or allure about them.” Cougars’ status as charismatic megafauna has earned them protection from hunting with dogs in Oregon and Washington, and, since the 1970s in California, protection from any sport hunting at all. Attitudes towards predators, however, very much depend on species and place, says Robinson. He points out that bears have long been a popular icon in American culture, whereas coyotes have been maligned as varmints — or as Vincent puts it, “big rats.” The large outdoor outfitter Cabela’s sells a whole line of “varmint/ coyote” hunting products. Both Robinson and Vincent point to an urban/rural divide in attitudes toward predators. Vincent says there is an historical bias against predators among farmers and ranchers, as well as from hunters, who fear large populations of top predators will negatively affect game animals like deer and elk. “People moving into exurban developments,” says Robinson, “may have an inordinate fear” of predators. It is against this backdrop of apprehension and reverence that Oregon legislators, wildlife agency officials, and citizens are now debating how to manage the state’s growing mountain lion population. In the early 1960s, when cougars were first classified as a game animal in Oregon, there were thought to be no more than 200 left in the state. By the mid-1990s, tightly controlled hunting, and what the Oregon Department of Fish and Wildlife (ODFW) calls “fully available habitat,” allowed cougar populations to increase to an estimated several thousand. Since then, Oregon voters further restricted cougar hunting by outlawing the use of dogs to hound and tree big cats. State wildlife authorities estimate Oregon’s current mountain lion population to be about 5,000. “We have some of the highest density of cougars anywhere in the West, especially in southern Oregon,” Roy Elicker, director of ODFW, told legislators at a hearing on September 12, 2008. 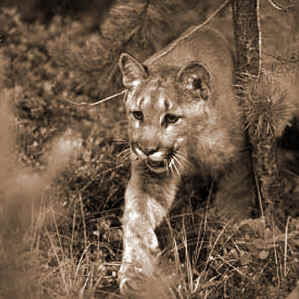 The primary objectives of Oregon’s 2006 cougar management plan — managing “the state’s cougar population at a level well above that required for long-term sustainability” and solving conflicts between human interests and cougars — encapsulate the issues surrounding our behavior toward predators. Are we willing to live with them? If so, how will we accommodate them while protecting our domestic animals and ourselves? If hunting is allowed, under what conditions and to what end will we allow the killing of animals more often regarded as trophies than meat? How will a conflict between humans and cougars be defined? Is seeing a mountain lion near your house a conflict, or must the animal first threaten you, your children, or your pets and livestock? — including state representative Peter Buckley (D-Ashland) — wonder if this decision has a sound scientific basis, and if it may encourage liberalized hunting, contrary to intentions of Oregon voters. A basic challenge of a numeric approach to managing cougars is how difficult they are to count. “It’s hard to track a cryptic animal like the cougar,” Robinson says. These are wide-ranging animals. An individual male cougar’s territory can be anywhere from about 50 to more than 100 square miles, depending on habitat, availability of prey, and the proximity of other mountain lions. These are generally solitary animals. Siblings may stay together for several months or more after birth, but then strike out on their own, sometimes traveling as far as 100 miles from their birthplace. And it is adolescent cougars, particularly the young males, who most often get into trouble as they move into increasingly fragmented habitat. Ron Anglin, ODFW wildlife division administrator, says that the current estimate for Oregon cougars comes from mathematical modeling based on hard data collected in the state over 14 years. “ODFW has never used complaints or anecdotal information to estimate populations,” he says. “From an agency standpoint, if someone calls to say they saw a cougar, this is interesting but not significant.” A cougar is counted only if there is verifiable evidence, Anglin says. Yet assuming the estimate of 5,000 cougars is accurate, the ODFW decision to allow the killing of what could be as many as 2,000 animals remains controversial as a matter of hunting policy and also from a wildlife biology perspective. Oregon state policy allows the killing of “problem” animals, those documented to be a threat to people, pets, or livestock. In recent years, the state has also dropped the price of a cougar-hunting license from $50 to $10, which hunting opponents see as state encouragement to kill cougars. To go after cougars caught in conflict with humans, ODFW makes an exception to the state’s ban on using dogs to hunt them. In the absence of available agency employees, ODFW has been deputizing citizens to take on this task. Representative Buckley questions the scientific basis of this policy and wonders, citing lobbying pressure in the legislature, whether this is a political decision — simply a way for the agency to allow otherwise banned cougar hunting with hounds — or an appropriate way to track down problem animals. Anglin assures me that the process for selecting deputized hound-hunters is rigorous, and that no killed animals can be kept by these volunteers, removing any incentive for trophy hunts. Still, wildlife advocates question whether this policy subverts the voters’ intention and undermines biology in favor of hunting interests. Recent studies of cougar behavior, including one conducted by Robert Wielgus, a biologist at Washington State University, indicate that removing young males from a cougar population where conflicts with humans were occurring did not reduce the incidence of such conflicts. Other young males simply moved into the same territory. In fact, Wielgus says, such removal can result in increased livestock depredation as more inexperienced cougars move into recently vacated territory. Camilla Fox explains that coyotes also respond to lethal control with biological mechanisms that increase their numbers. “When [depredation] happens, they tend to have bigger litters,” she says. Fox points out that removing both top predators like cougars and meso-predators like coyotes can have what she calls “a deleterious effect” on the entire ecosystem. With these predators absent, those further down the food web, such as raccoons and foxes, increase. Large populations of these animals that are not subject to natural controls can have a negative effect on ground-nesting birds and songbirds. The upshot is that taking significant numbers of young, particularly male, cougars and coyotes may not produce the desired reduction in conflicts with people and livestock, and may eventually lead to imbalances throughout a local ecosystem, including serious declines of smaller birds. “It’s a very emotional subject,” Anglin says. “We don’t want the population to get below 3,000 animals. If at or below 3,000, we’ll stop all hunting seasons and actions.” Whether this will satisfy the Oregon Farm Bureau, whose members would like to see aggressive action to reduce conflicts with livestock, remains to be seen. Yet when asked, Farm Bureau spokesperson Katie Fast says that despite a rise in cougar numbers and increased concern for safety among Farm Bureau members, there had not been any recent rise of cougar livestock depredation. Part of that understanding, explains Fox, is shifting from lethal to non-lethal control. 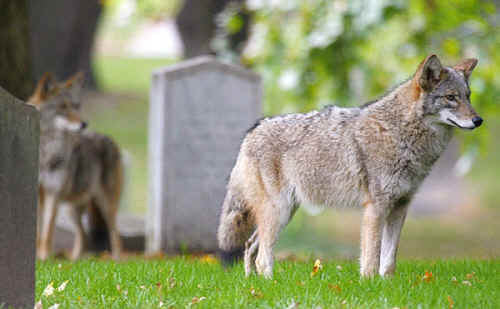 “Part of our message,” she says of Project Coyote, “is encouraging proactive action to reduce uncomfortable encounters.” Essentially, don’t let the animals become habituated to feeding, whether it’s on garbage, pet food, or other edibles left in the open, or even on the pets themselves. When the food is livestock, the measures are more complicated, but ranchers in wolf country have had success with nonlethal protection of sheep and cattle, especially when coupled with a compensation program. While coyotes are far more prevalent than cougars will ever be, the same holds true for these top predators, as it does for others, including the dexterous black bear. “Man is here to stay and we need to manage food for human beings first,” said a citizen testifying at the September 12 Oregon hearing, weighing in on the side of aggressive predator management. But, Fox says, these are top keystone predators and an integral part of their ecosystem. The landscape has changed and these animals are adapting, she explains. “Love them or hate them, they’re here to stay,” Fox says. How predators fare in the 21st century depends on how we adapt. Elizabeth Grossman is the author of High Tech Trash. Her next book is called Redesigning the Future and will be published in 2009. Originally published on Project Coyote, a project of Earth Island Institute.